USD was empowered by Yellen’s speech. The support rests at 113.670 with resistance at 114.090 which both lines are above the weekly pivot point at 112.860. The EMA of 10 is moving with bearish bias but it is located above the EMA of 100 and the EMA of 200. The RSI is moving horizontally on 50 level, the Stochastic is moving in low ranges and the MACD indicator is in positive territory. The ADX is showing buy signals. The price is above the Ichimoku Cloud and the Chinkou Span. The Tenkan-sen and the Kijun-sen are both showing a horizontal trend. 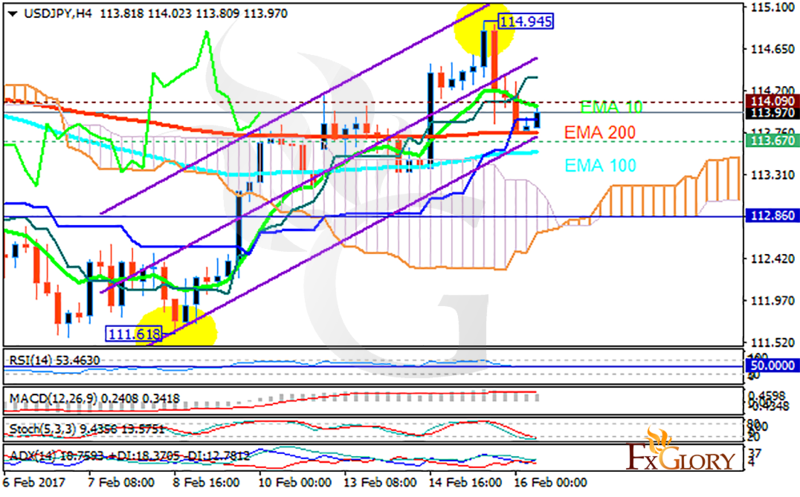 It seems that USDJPY is rising within the ascendant channel targeting 116.00.